Welcome to another Just Add Ink challenge! 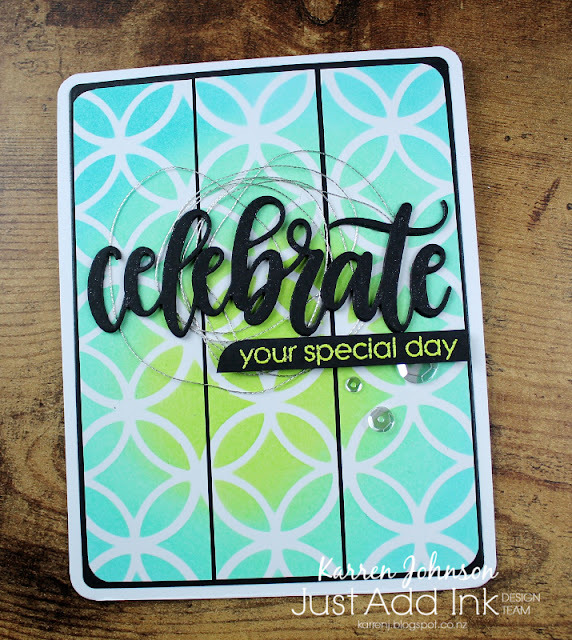 I chose the theme this week and I'm after stencils. I just love stencils and have quite the collection. They're affordable, easy to store and create such a wonderful effect for little effort. I used distress inks to create my stenciled panel, keeping the Twisted Citron in the centre then fanning out with Cracked Pistachio and Peacock Feathers. Once I'd finished stenciling, I rounded the four corners then cut the panel into three vertically. I mounted the three strips onto a black panel and then onto a white top-folding card base. 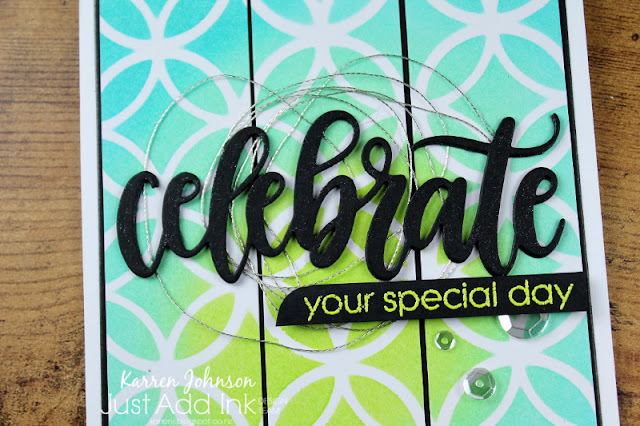 The die-cut sentiment is stacked four high and painted with clear sparkle pen. I embossed the rest of the sentiment onto a black strip using a lime green EP called Cricket. A silver thread nest was placed behind the sentiment and I finished with some sequins. Thanks for visiting! Head on over to the JAI blog to check out the gorgeous cards made by the DT. Oooo love that Citron! Beautiful background! You are so smart to cut that into three, Karren... what a wonderful touch to see that black popping through... fabulous! Eep! I love the colorful background. If nothing else I'm coming to New Zealand just so I can watch and learn from you! Love the black die cut sentiment too. Those black accents really make this card pop! Stunning card, Karren. Absolutely love your colour combination! So bright and vibrant against the black - especially the sentiments. Love how you used the stencil with multiple colours, and cut your background into panels. So creative! Your stencilled background is gorgeous Karren. I love the panels you created and the colours - so much to love! Perfect use of this awesome stencil!! What great colors!! What a great use of stencils! The colours are so bright and your blending is really gorgeous! Love the black sentiment against it too! What a cool stencil, and I LOVE the colours you've used. So striking and fabulous, Karren! I love the clever way you cut your panel in 3's to show the black peeking through...love your silver thread, too! I love how you cut up your background and matted it on the black. Really lovely design!